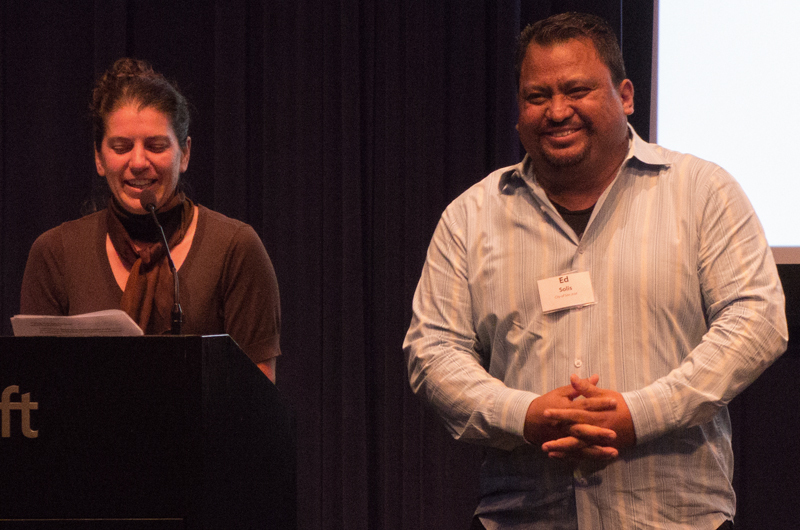 Shiloh Ballard, SCVBC executive director, recognizes Ed Solis for Viva CalleSJ success. I can imagine the reaction from the police when San Jose parks and recreation superintendent Ed Solis submitted a request to shut down six miles of streets in San Jose for a recreational event in 2015. Most other public agencies also balked, but Solis persevered. He saw first-hand the success of a similar “Open Streets Project” held in Guadalajara, as well as San Francisco and Los Angeles. Solis built a coalition of the willing, including the Silicon Valley Bicycle Coalition (SCVBC). Solis was recognized by the SCVBC for the San Jose event at its annual bike summit held in August. Viva CalleSJ, as it’s called, now in its third year, expects more than 100,000 participants to join in the fun on streets between Japantown and Lake Cunningham Park. Solis said that in addition to allowing people to get out and exercise safely, this is a social experiment in bringing residents together from all walks of life. Looking at the photos of smiling faces cycling, walking, skateboarding, and more, I’d say the results make it worth the effort and occasional inconvenience. Viva CalleSJ will be held on Sunday, Sept. 17, 10 a.m. – 3 p.m. This entry was posted on August 29, 2017 at 4:46 pm and is filed under News. You can follow any responses to this entry through the RSS 2.0 feed. You can leave a response, or trackback from your own site.